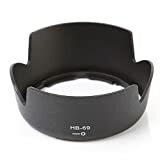 Dedicated lens hoods are designed to match the specific focal length of the lens it designed for. Suitable for Nikon AF-S DX NIKKOR 18-55mm f/3.5-5.6G VR II lens. Replacement for Nikon HB-69. Black matte inner surface is designed to reduce the light’s glare, Prevent glare by stopping light from coming into the lens at side angles. Extra protection from accidental impact. The bayonet mount design makes it firmly on the lens. Plastic Material Black color petal shape. Included: 1 x Lens hood replaced for HB-69. This entry was posted in Discount Photography and tagged 1855mm, Bayonet, D3200, D3300, D5200, D5300, f/3.55.6G, Flower, Fotga, HB69, Hood, lens, Mount, NIKKOR, Nikon, Petal, Replacement by Ball Photo. Bookmark the permalink.